Welcome to another Friday Stamp Man challenge where this week we want you to show us anything vintage. the Stamp Man on-line store, and create a vintage postcard. As always there is a chance of winning a £10 voucher to spend with The Stamp Man, so let's see what you are creating in a vintage style this week. Apologies that I am a bit MIA again at the moment, school really is taking up so much of my time and I have another workshop today at The Art of Craft, so blogging has taken a back-seat this week I am afraid. Anyway I hope you have a great Friday. Take care. Your card is so pretty and the post card written side looks so real, wow! Great job! With so much going on in your life I'm sure we all understand you being MIA and yet you still produce an excellent piece of work in amongst it all - hope you find time for some downtime. 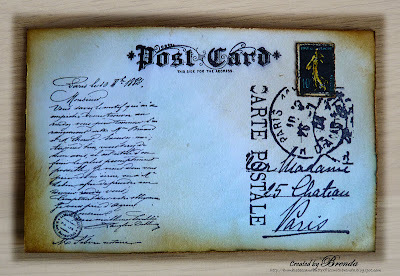 Beautiful postcard, loving those stamps. Stunning Brenda!...you have already used the distress markers...do they please you?....I'm thinking of buying them too! 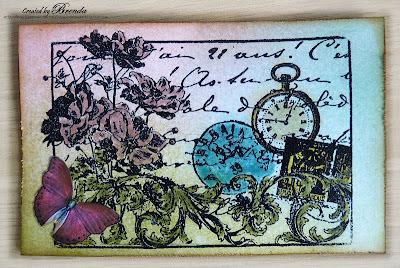 Beautiful post card, Love those stamps and the colours you have used. Have you noticed how school gets in the way of our crafting???!!! We had photo day at school. Never felt so frazzled before! So pretty, brenda, the colors are charming! Wow this is gorgeous Brenda! your stamping is amazing - so beautiful and you've really captured the vintage look! Hope you have a wonderful weekend hun! Dear Brenda, I adore your fabulous creative work so much! Stunning card!